Start your Colorado ski vacation right when you step off the plane, with a luxury shuttle from Denver Airport. This is your safe and convenient transportation to the ski areas surrounding Denver. 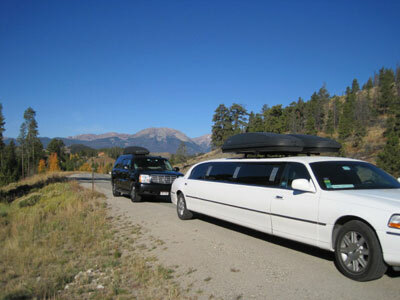 Call us today at 970-390-3599 to book your limo today! We can deliver you to any location in any of these towns, and if you are looking for private car service to another town, just contact us for a quote. Please call for discounts on smaller groups. We respectively add 18 % gratuity for SUV's and 20 % gratuity for the limousines. Fuel charges may be added to some charters. The ladies loved the first class treatment with the Limo and great service, meet & greet and taking care of luggage, all in all making the ladies feel comfortable, FANTASTIC. Thank you for taking care of picking up the "Greeting Lunches" and Champagne for our trip from Denver to Breckenridge and thank you for your prompt pickup for our trip from Main Street Station back to the Denver airport. The Champagne, OJ and your own fresh baked cinnamon rolls were a fantastic treat and a great added personal touch to compliment your level of service. We will stay in touch and will let you know the dates of our next trip to the Rocky Mountains. We hope that to be very soon, we still miss our special friends.